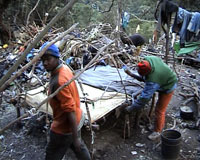 In Benyounes forest, “la foret” as they called their habitants, was the last stage of a long trip for thousands of people coming from Sub-Saharan Africa. Close to the fence that divides Ceuta (Spain) from Morocco, they establish in a variable time, before flank the last obstacle in they way to Europe, looking for a better life. Sometimes running away from wars, politics persecutions, hunger or a precarious economy situation. Lots of times of all of this. 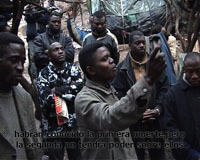 In years, the migrants pass across this forest and after some weeks or months they manage to arrive to Ceuta. 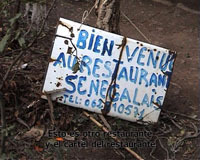 In finals of 2004, European union start agreements of subcontract Morocco in the control of the Spanish – Moroccan border. 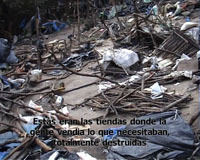 The habitants of the forest, started to feel the effects of this agreements: the increase of illegal devolutions, the abuses from the civil police, they install police controls near the forest, they forbid the access to current water, military attacks to the camps in with they made mass arrests and rapes as a war weapon. The border it's close. Systematic violation of human rights, financed with the tax of the democratic European Union citizens. The migrants organize themselves in spaces like this and construct spaces; support nets in Moroccan territory, confronting and resisting this way the European politics. In the forest of Benyounes, they organized themselves from origin communities. 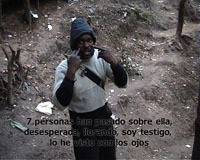 In February of 2005, decided between all the community's, record this video, to made visible their situation, in with they report the systematic violation of their human rights, the absolutely abandonment from the NGO's, Associations an Human Rights Institutions, an they demand their citizens condition and they require their rights as human beings.